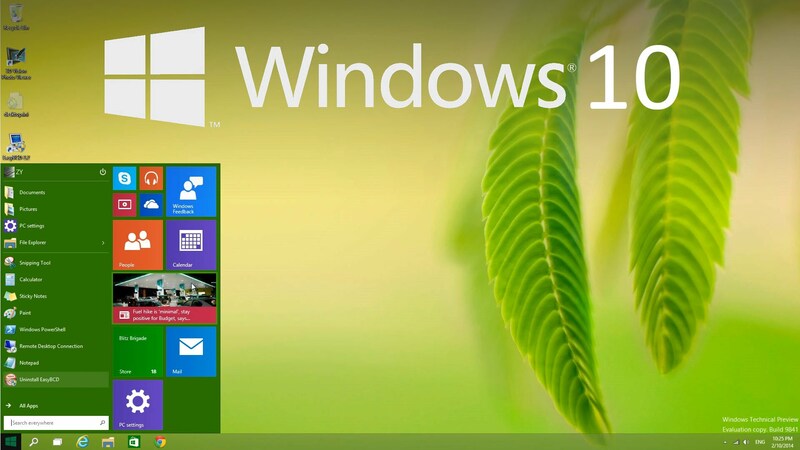 Windows 10, the new operating system from Microsoft, is sold with new computers since 2015. In order for our programs to be fully compatible with this system, we have worked on the version 10 of our astrological software. This new version is now ready for Windows 10, 8, 7, Vista and XP-sp3 (but is not compatible with Windows 10 S mode, Windows Phone or Windows 8 RT). 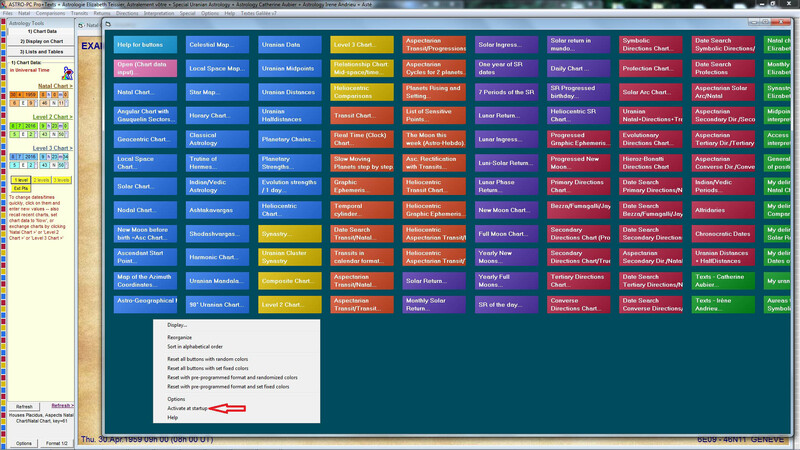 We have added many new features and options, as you can see below (Version 10). 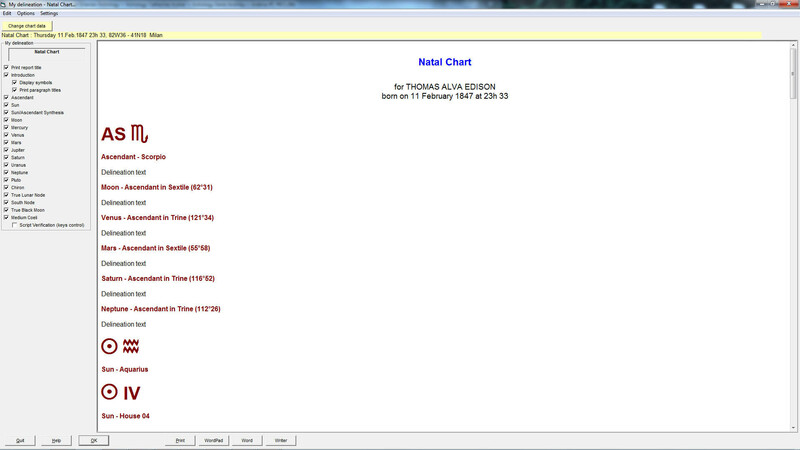 Of course, you can download a demo version to discover the many changes and see all the advantages of the new version. You will find in this section more information about the actualization prices if you desire to upgrade your older program. At the bottom of this page is a list of the new functions and improvements that have been made between the different versions of our programs. 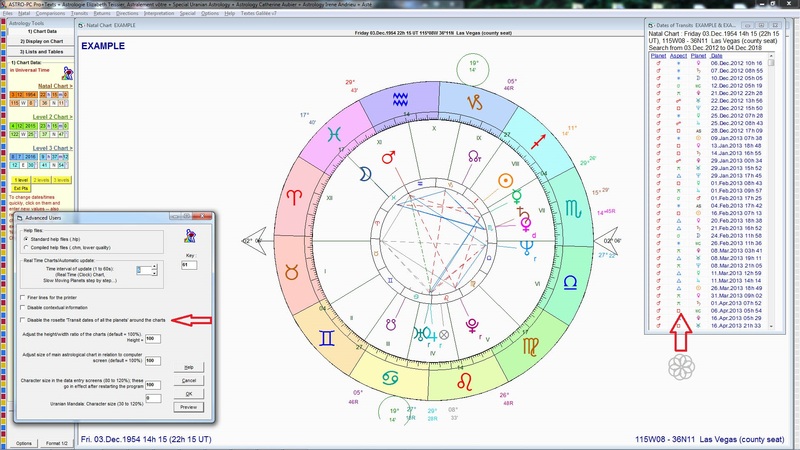 You will find below a summary of the changes in version 10 of our astrological programs for Windows 10, 8, 7, Vista and XP-sp3 (not compatible with Windows 10 S mode, Windows Phone or Windows 8 RT). This new release is particularly designed for Windows 10 and the touch screens. You can download a demo version to get a better idea of all the new features. If you already have a previous version of our programs, you can also install and use the Demo 10 without problems, as it is copied in a different directory. 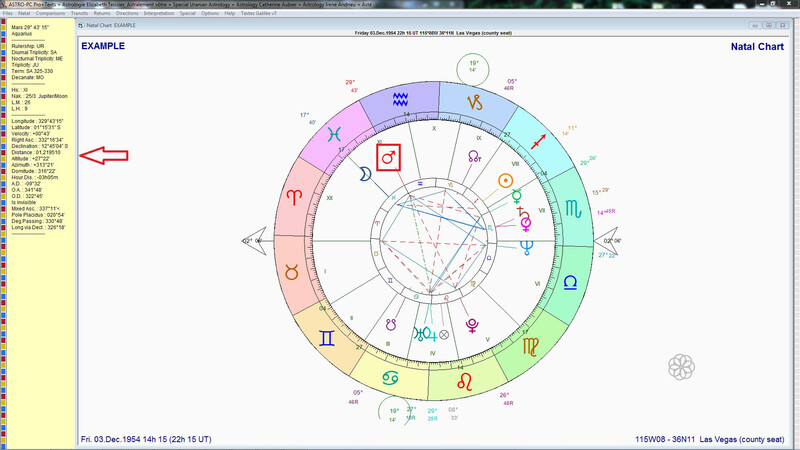 SUA = Special Uranian Astrology. We are of course at your disposal to advise you and for any other kind of information. 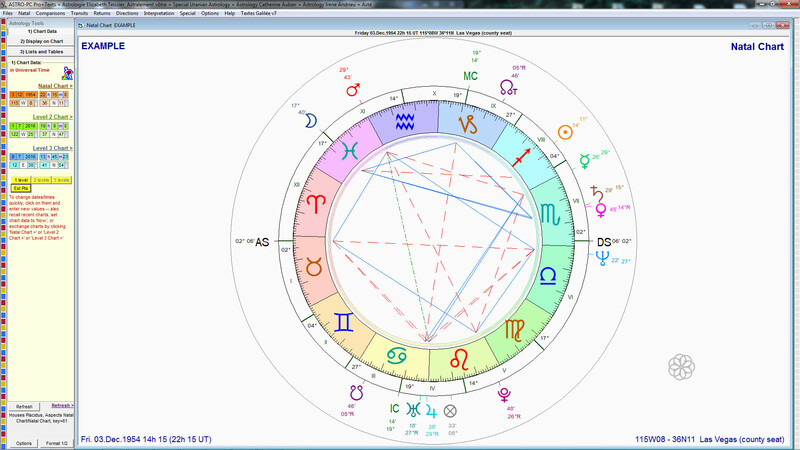 For the Natal chart, you can now add your interpretation texts for Chiron, Ceres, the Part of Fortune, the New Moon position and the Full Moon position. 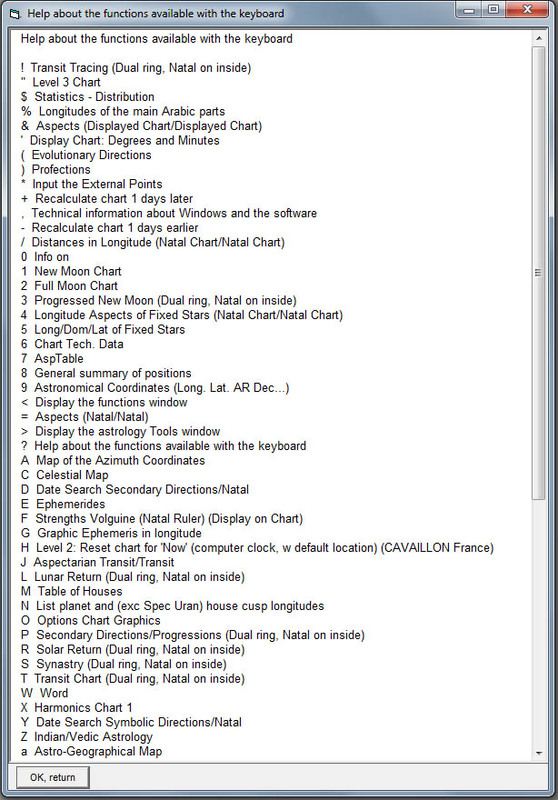 If you display several positions for the Black Moon, the Options menu of the interpretation window allows you to specify which one must be taken into account in the delineation. 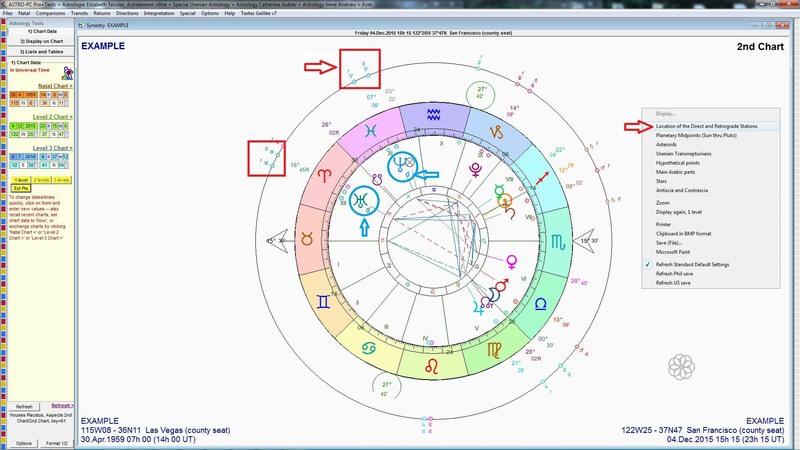 In case of repetition of an aspect in the text (for example "Sun square Mars", followed after by "Mars square Sun"), it is possible to display its mention only the first time. For the title of the aspects, you have the option to display the title in the usual form with the name of the aspect, for example "Jupiter - Mars in Square", or only with the mere mention of the nature of the aspect: "Jupiter - Mars in negative aspect". 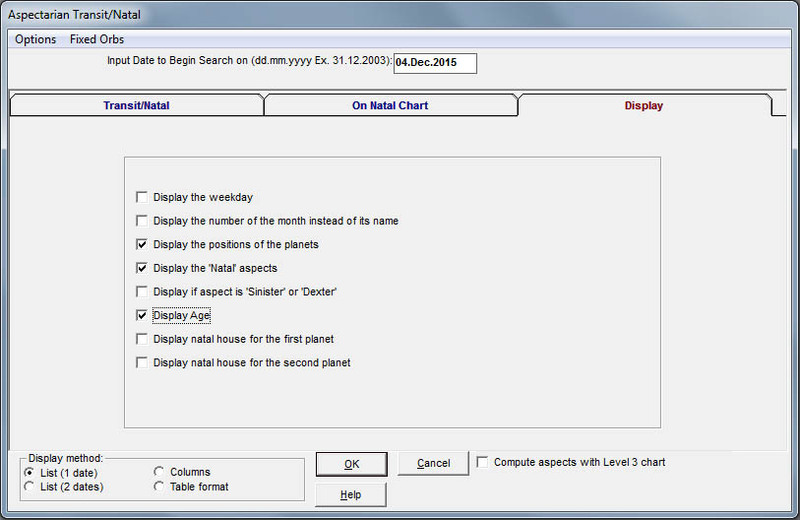 You can now add an introductory text to the interpretation of each planet. You can download a demo version to discover the many changes and see all the advantages of the new version. You will find in this section more information about the actualization prices if you desire to upgrade your older program. 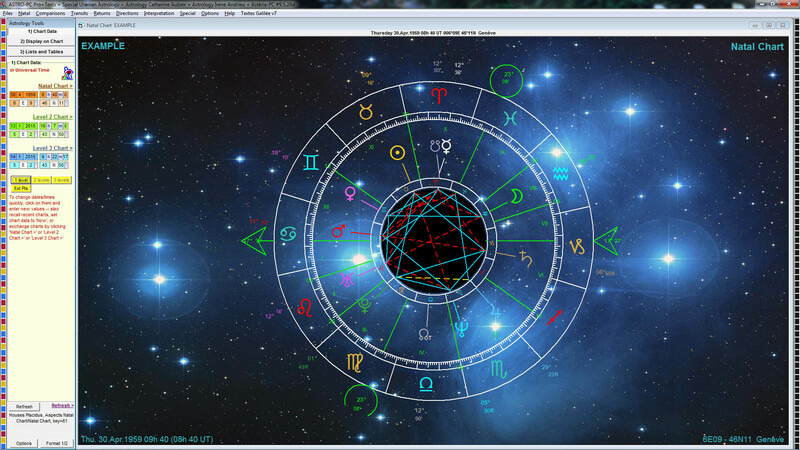 You will find below a summary of the changes in version 9.5 of our astrological programs (for Windows 8, 7, Vista and XP). This new release is particularly designed for Windows 8 and the touch screens. 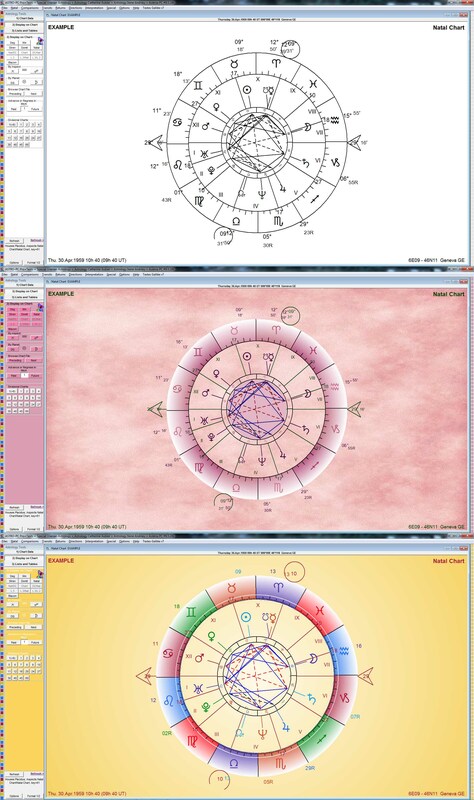 New window of buttons to access the functions: In order to be harmonized with the new “Modern User Interface” of Windows 8, our astrological programs now offer a window of the same style, with large colored buttons that allow you to select the astrological functions with a single click or with your finger. 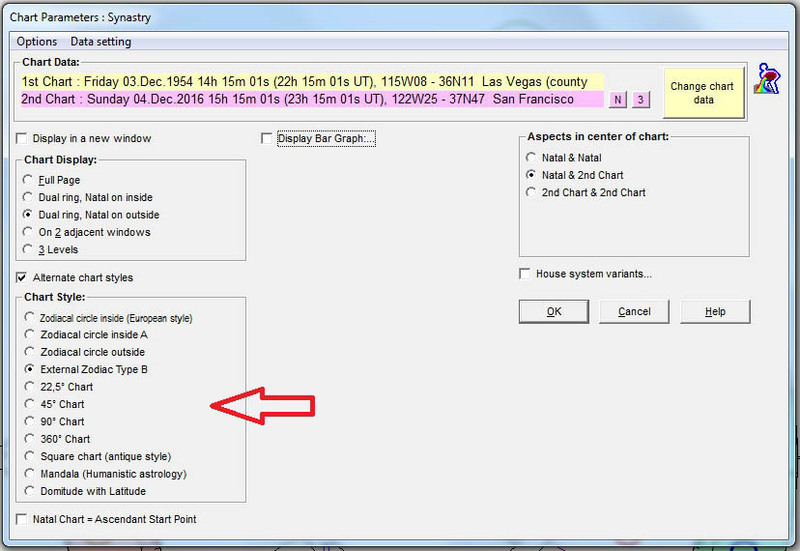 Depending on how you activate a button/function, you get directly the display of the chart, or the full setting window, or a new simplified configuration window which allows you to select the desired display for the chart. 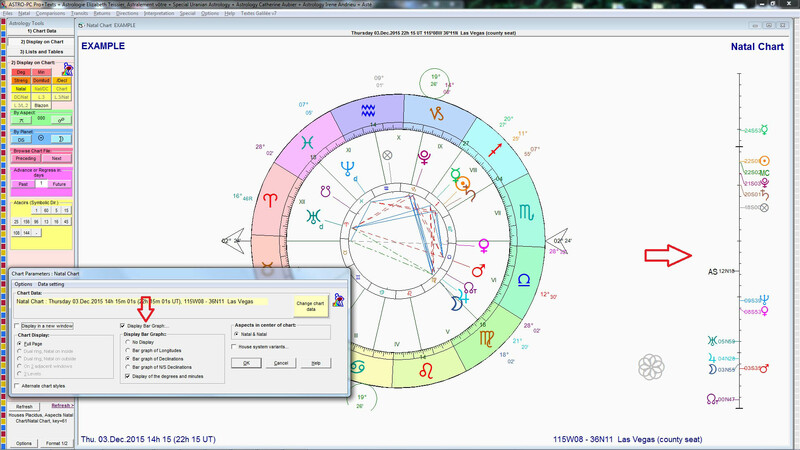 New access to the buttons of the toolbox: To facilitate the use of the functions of the “Astrology Tools” window with a touch screen, but also to access it more quickly and easily with the mouse, you can now view around the chart all the buttons that you want, to get the list of planetary positions, the aspects, and more. 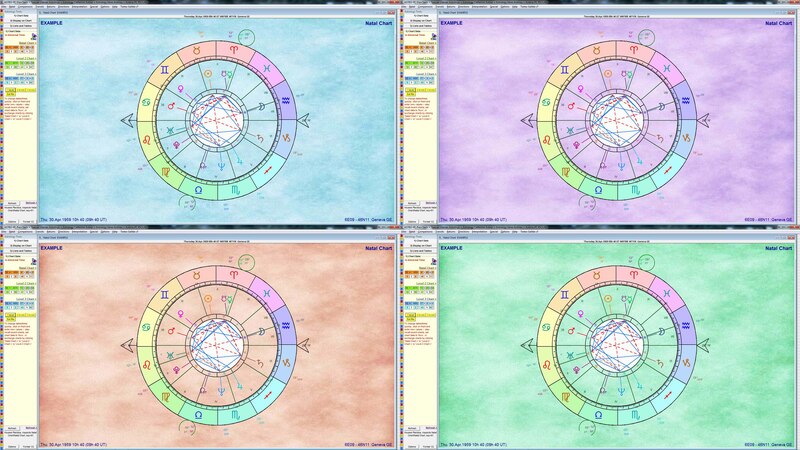 New astrological symbols: You have now several choices to display the signs of the zodiac and the planets. With some programs, you can now print out pages of ephemerides as in our “New International Ephemerides 1900-2050” and also get pages of tables of houses as in our book “Tables of Houses”. 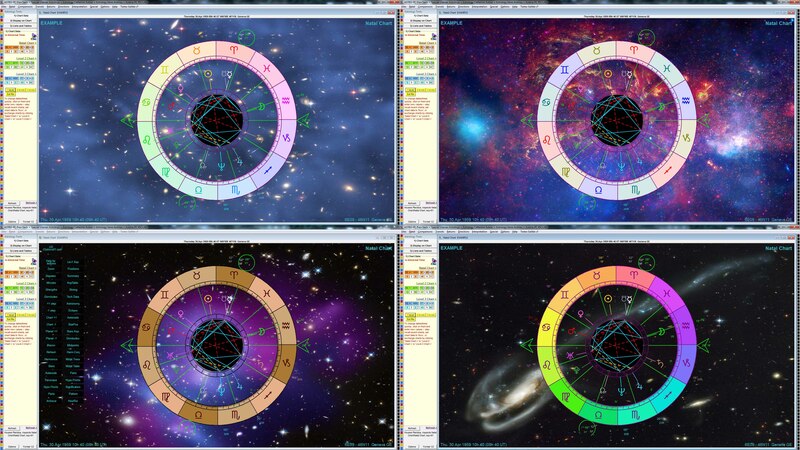 With Astro-PC, you have even more possibilities: You can get the ephemerides with the tropical or the sidereal zodiac, and that for the years 3000 BC to 3000 AD. Moreover, it is possible not only to obtain the usual ephemerides, i.e. with the longitudes of the planets, but also planetary ephemerides with the positions in declination or in latitude. 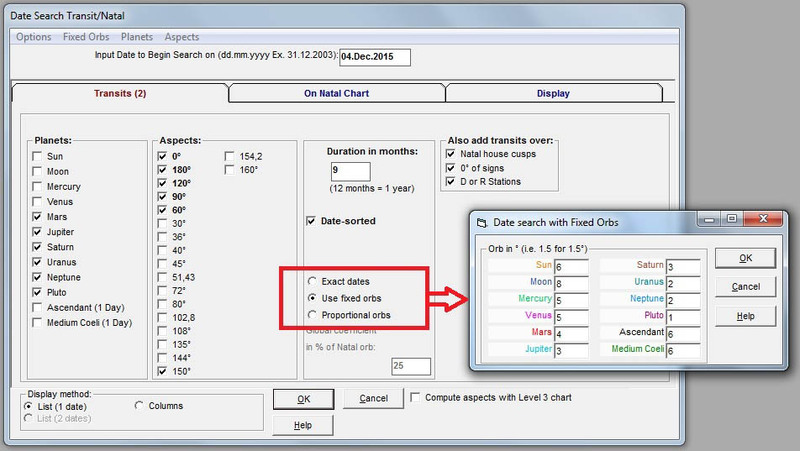 Like for the ephemerides, you can view on screen or print out pages of Tables of Houses, for whatever latitude in degrees and minutes, thus more accurately than our paper book. You can also select different house systems. 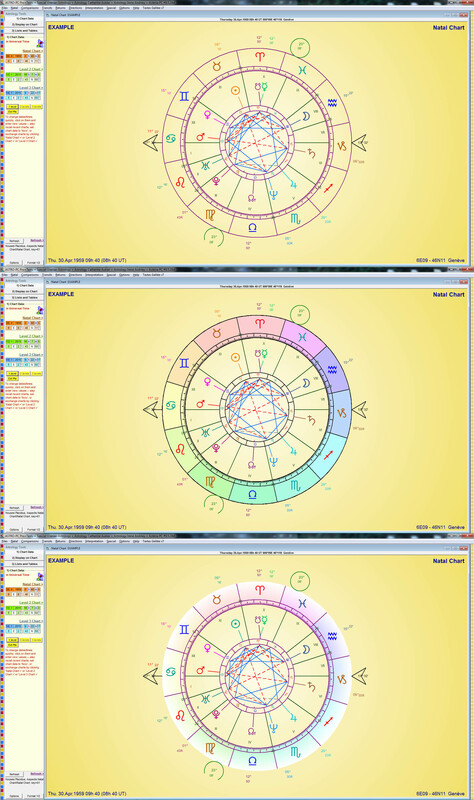 The calculation method most frequently used is Placidus, but you can select many others (Regiomontanus, Campanus, and more). 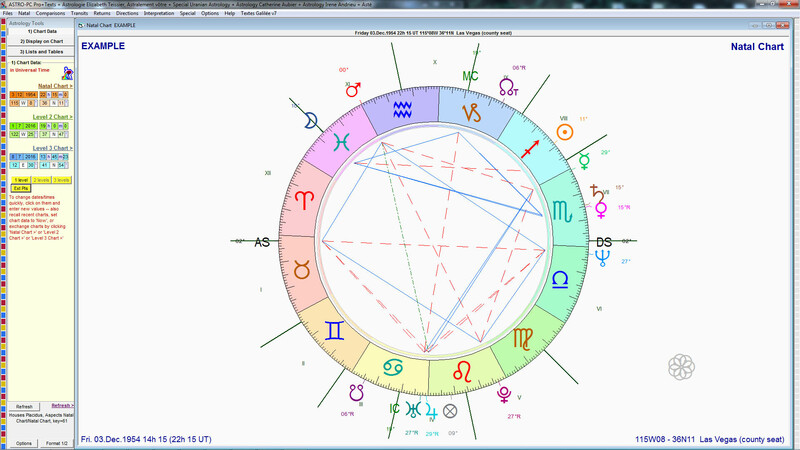 New chart styles: Version 9.5 offers three new display styles for the astrological charts. New pre-set graphic schemes: See at the beginning of this page. Version 10 improvements (from version 9.5 to version 10): See here. Version 9.5 improvements (from version 8.7 to version 9.5): See above. New features of version 8.7 (from version 8.5 to version 8.7): The version 8.7 of our programs is fully compatible with Windows Seven, Windows Vista and Windows XP. 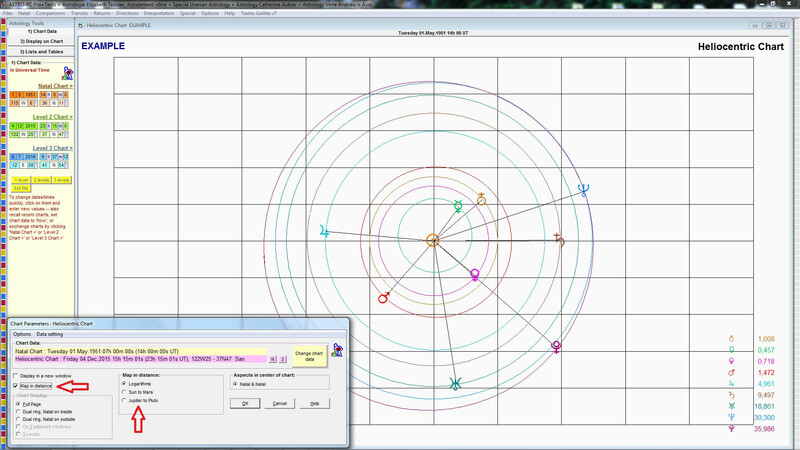 The software have been entirely reviewed to be able to run without problems on the Windows 7 environment. 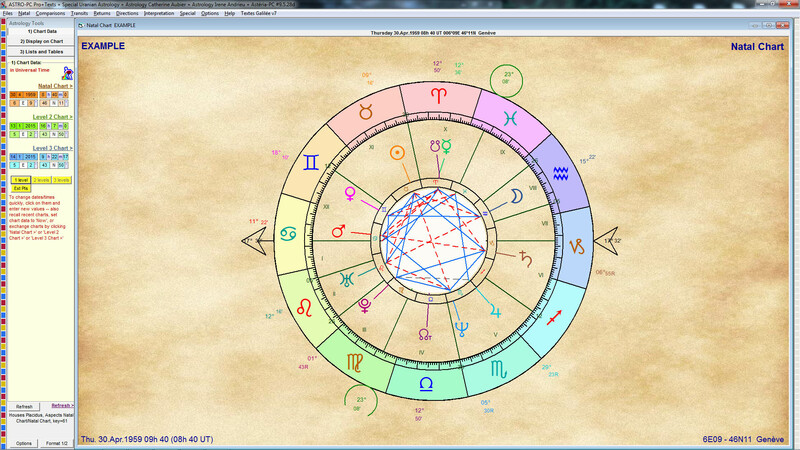 There were only technical changes, no new astrological functions have been added between version 8.5 and version 8.7. 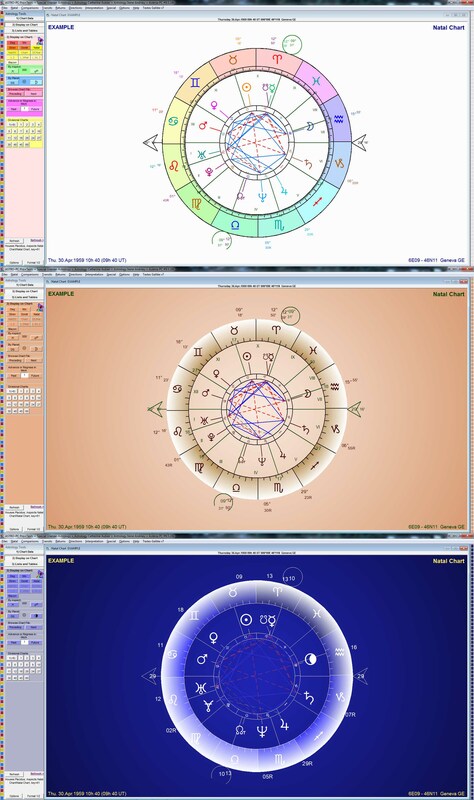 Improvements of version 8.5 (from version 8.0 to version 8.5): The version 8.5 of our astrological programs is fully compatible with Windows Vista and Windows XP. The software have been modified to run without problems on the Windows Vista environment. 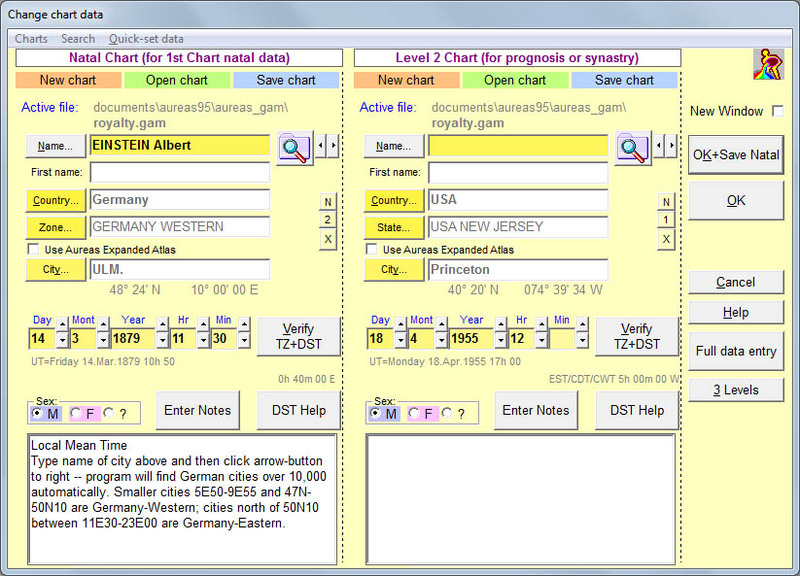 In addition to numerous technical changes, you will also find in this release some new functions : Help for entering the chart data (the data input in easier and more intuitive). — The daylight/summer time files have been updated. 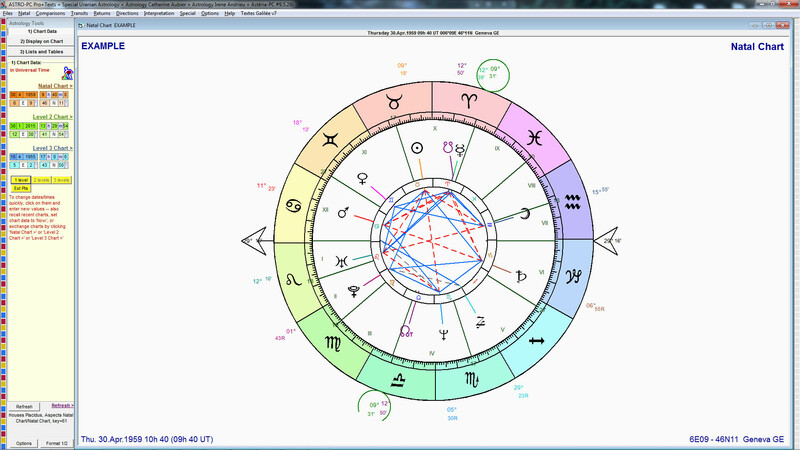 — New display for the charts: Domitude chart (with latitude), with several options for the display. 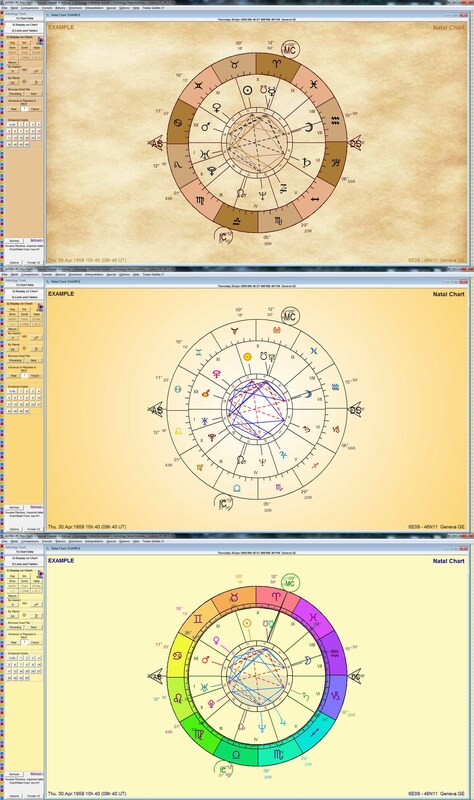 — Uranian astrology: You can now input your own interpretations for the midpoints, Planetary positions in the 6 house systems according to Alfred Witte, New display for the charts: 45° Wheel, Uranian patterns, Grimm cities. — Function “Elemental Qualities” according to C. Castanier. — Function “30 lunar days” according to M. Raulin. New features of version 8.0 (from version 7.0 to version 8.0): This file is available in French only. Click on this link to get the list of the changes made. Version 7.0 improvements (from version 6.5 to version 7.0): This file is available in French only. Click here to see what was added between these two versions.